i made you a cake. i am fibbing. i made this cake for my dad's birthday. there's a good chance you know of this cake. everyone should know about this cake. everyone should take a giant forkful of this cake and close their eyes. ahh. shiny salty caramel, creeping slowly towards the edges and soaking into the layers. and ganache! with more caramel whipped into it!? the baked gentlemen surely know how to get it done. 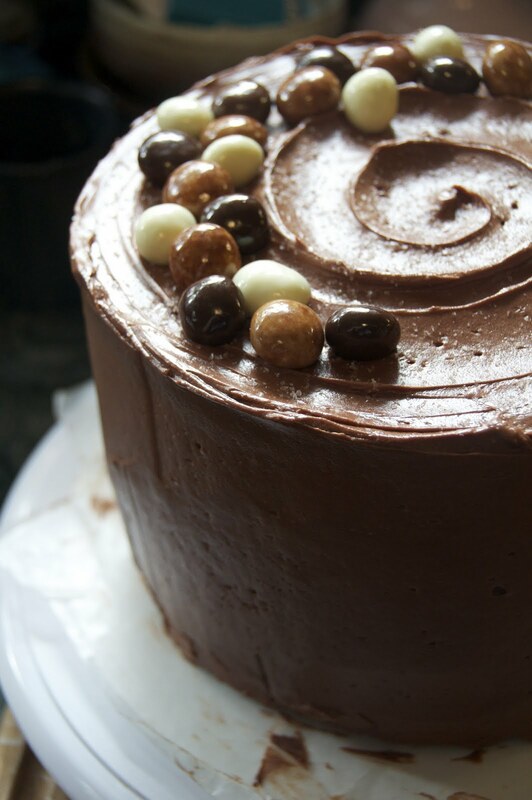 this cake is quite a doozy, what with all the temperamental caramel involved. set aside a good chunk of time to make it. 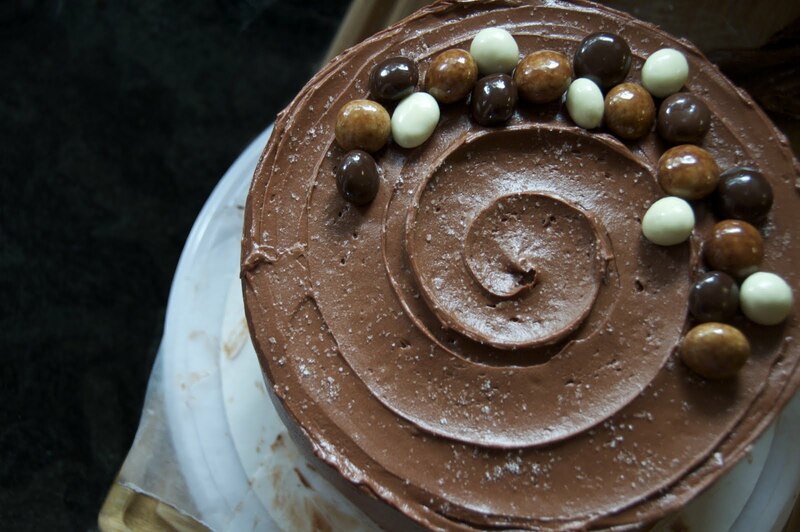 but i ridiculously encourage making this cake. sweet and salty for president. preheat oven to 325. butter 3 8-inch round pans. line the bottom with parchment and butter the top of the parchment. then knock some flour around in it. combine cocoa powder, hot water, and sour cream. set aside. sift flour, baking powder, baking soda, and salt. using a mixer, beat butter and shortening on medium speed til ribbon-like, about 5 minutes. add eggs one at a time, beating well after each. add vanilla and mix well. make sure to scrape down sides of the bowl and mix again. add flour mix, alternating with cocoa mixture, beginning and ending with flour. divide batter into 3 pans. smooth out tops. bake 35-40 minutes. in a small saucepan, combine cream and fleur de sel. bring to a simmer over really low, til the salt has dissolved. careful not to let it burn while you make the caramel. in a medium saucepan, combine 1/4 cup water, sugar, and corn syrup, stir and try not to splash the side of the pan too much. cook over high heat about 6-8 minutes, until a candy thermometer reads 350. remove from heat and let cool for 1 minute. add cream mixture to sugar mixture. whisk in sour cream. 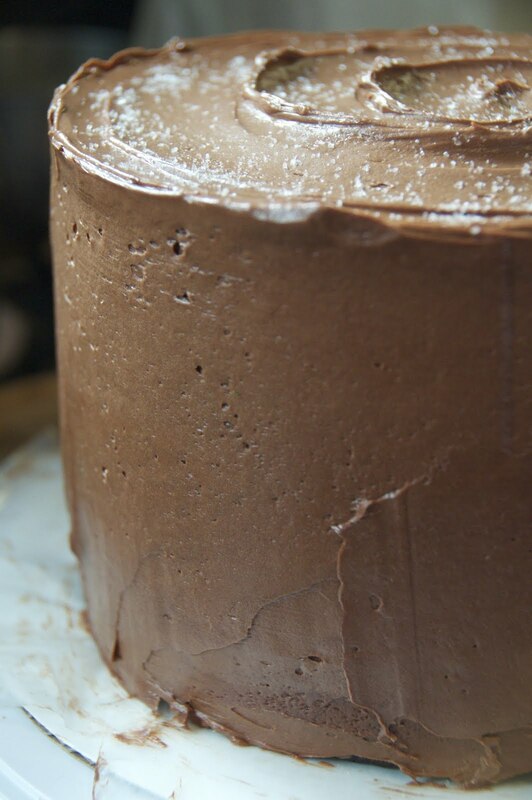 let caramel cool to room temp, then transfer to an airtight container and refrigerate until you're ready to assemble the cake. put chocolate in a big heatproof bowl and put aside. bring cream to a simmer over low heat. make sure it again doesn't burn. in a medium saucepan, combine 1/4 cup water, sugar, and corn syrup stirring carefully. cook over high heat for 6-8 minutes until thermometer reads 350. remove from heat and cool 1 minute. add cream to caramel. stir slowly for 2 minutes. then pour caramel over chocolate. let it sit for a minute and then stir until chocolate is all melted. let cool, then transfer to a bowl with an electric mixer. mix on low speed until the bowl feels cool, increase speed to med-high and gradually add butter, beating until incorporated. scrape sides and beat til fluffy. place a cake layer on a platter. 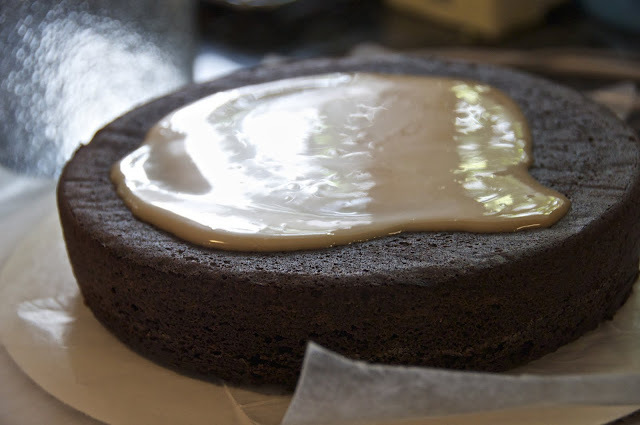 spread 1/4 cup caramel over the top and let it soak into the cake. spread 3/4 cup of ganache frosting over the caramel. sprinkle 1 tsp fleur de sel over the frosting. top with the second layer. repeat with the caramel, ganache, and tsp of fleur de sel. top with third layer. spread with caramel. frost the outside of the cake and sprinkle fleur de sel over the top. it can be kept in the refrigerator but let it come to room temperature for at least 2 hours before serving.